Hi guys! Jacqueline here. Happy Friday and first day of February! It’s no secret that I’m a baby when it comes to cold weather. Every year in January I struggle with a bad case of the winter blues (or a self-diagnosed case of seasonal depression) and I know I’m not the only one out there. I’m the type of person, that once Christmas and New Years is over, I’m ready for spring and would be totally fine skipping winter altogether. Unfortunately though- I live in the Midwest, where winter seems to last a lifetime and we don’t see much sunshine from the months of November-March. For those of you in the same boat (which is probably a lot of you with the Polar Vortex), I’m here to hopefully help lessen the blow winter can have on our moods and overall lifestyle. Over the years I’ve found small ways to beat the winter blues and bring life back into a somewhat “dead” season. If you also experience a wintertime funk, click through for 10 ways to beat the winter blues. 1. Tackle a project on your to-do list. 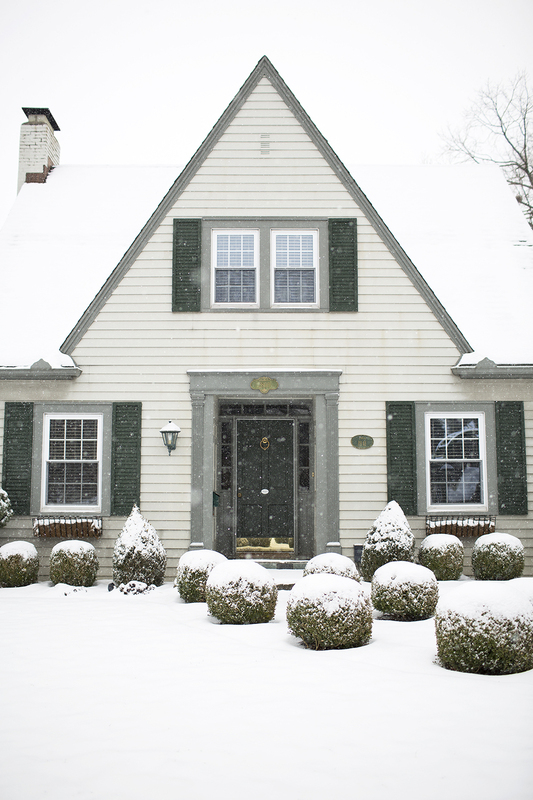 There’s no better time than winter to tackle a project that has been on your to-do list for awhile. Given the frigid weather, you may find yourself spending much more time inside (depending on where you live), so why not finish that project you’ve been putting off for far too long? One of the projects on my to-do list for the year ahead is to replace all of the blinds in our home. When we moved in there were awful window treatments (think heavy, dark linens that smelled of must) so we drove to Lowes and frantically bought the first thing we found to get a little privacy. After living with them for a few years, it’s time to upgrade. They’re heavy, hard to clean and are a pain to lift up (the strings are always uneven and get tangled all the time). Not to mention- I just don’t like they way they look. We recently swapped out the blinds in our living room with an extra set of drapery panels and it left the room feeling so fresh and bright! I plan to tackle one room at a time this year. It always feels good to cross things off the list… it’s an instant mood lifter! 2. Give your bedroom a cozy update. If you’re going to be trapped indoors, you might as well feel like you’re at a luxe hotel. Giving your bedroom a refresh might be just what the doctor ordered to help cure those winter blues. 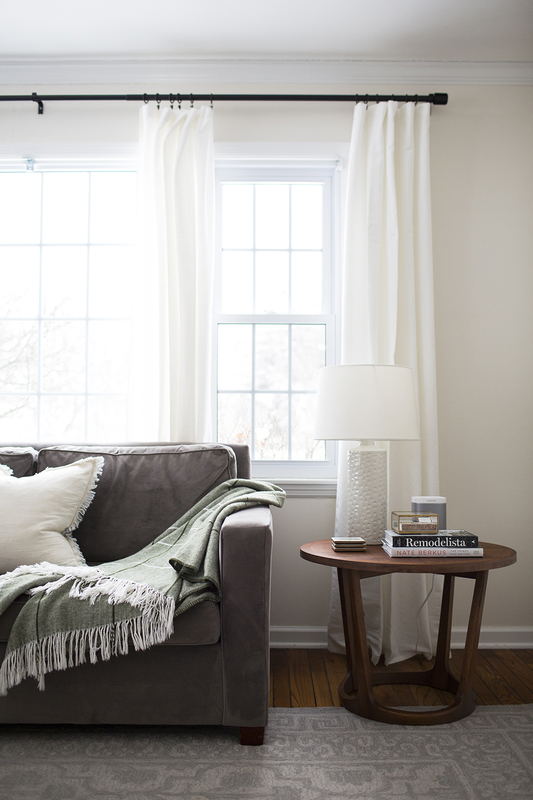 Swapping out bedding or pillows can be an easy, inexpensive way to bring a whole new look to a space that is in need of a little facelift. 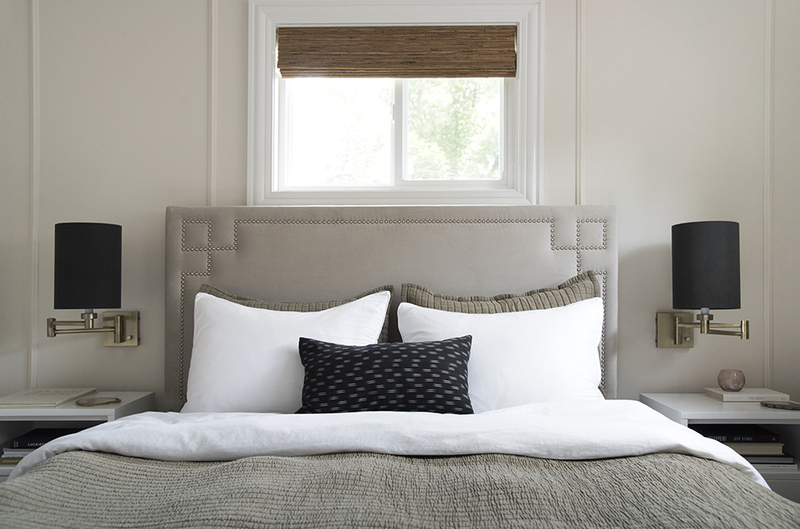 Adding additional layers or heavier bedding for the winter season will also make it feel warm, cozy, and inviting. 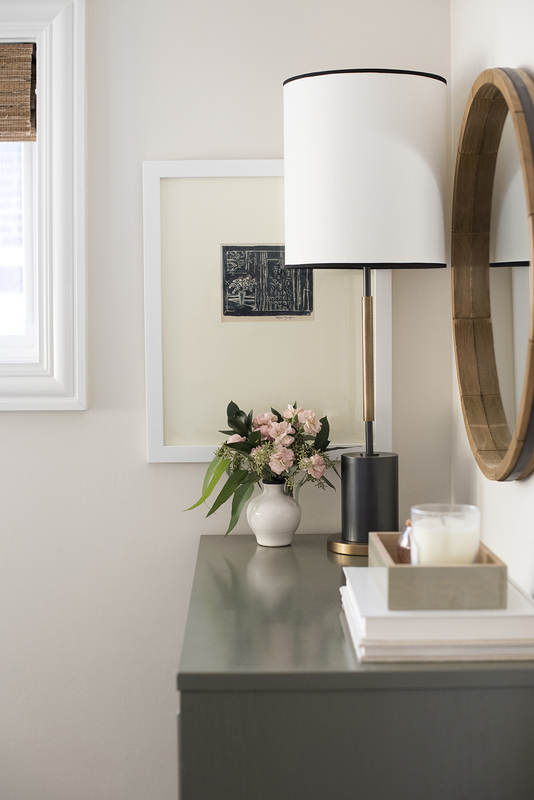 Borrow items from other rooms in your home and do a little styling swap- it’s amazing how changing the little things can instantly make a space feel new. For example, Sarah updated their guest bedroom in their Utah Rambler just a year after completing it and it was definitely worth while. This is a great option for those of you who like change as much as I do! 3. Light it up… with candles or a fire. There is just something about lighting a candle or a crackling fire that instantly adds warmth and coziness to your home. In the winter we need as much of that as we can get! There isn’t a night that goes by that we don’t have either a fire burning in the fireplace or a candle (or two or three) lit in our home- it’s a must during those cold winter months! 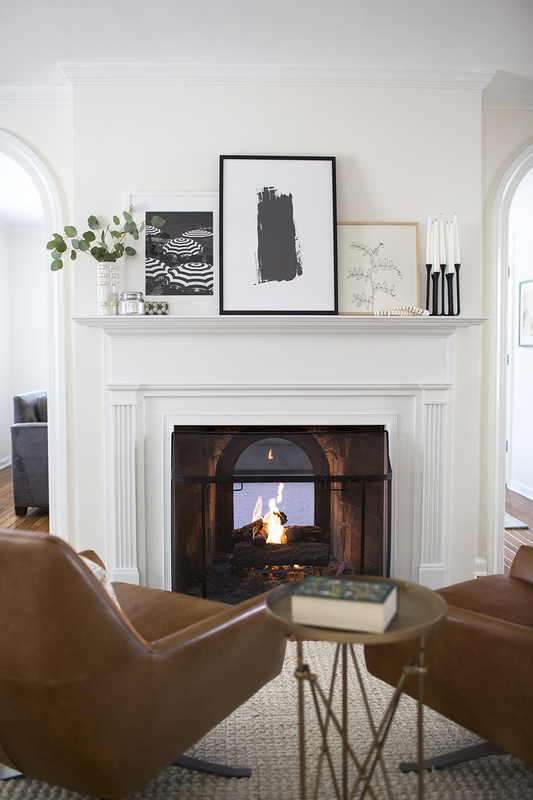 If you don’t have a functional fireplace, Sarah shared an easy fireplace DIY to achieve the same look and feel using candles. Last fall I shared a few of my favorite candles to stock up on, and I’m still using some of the candles from that very list. Although fresh flowers can be hard to come by this time of the year (again…dependent upon where you live), bringing life into your home is a mood booster in itself! If you live somewhere where you can find decent florals, bring some home from the grocery each week and elevate a room with something organic and fresh. Otherwise, I love using greenery that you can find year-round such as eucalyptus. Style it on your nightstand, on a mantle, or centered on your dining room table. 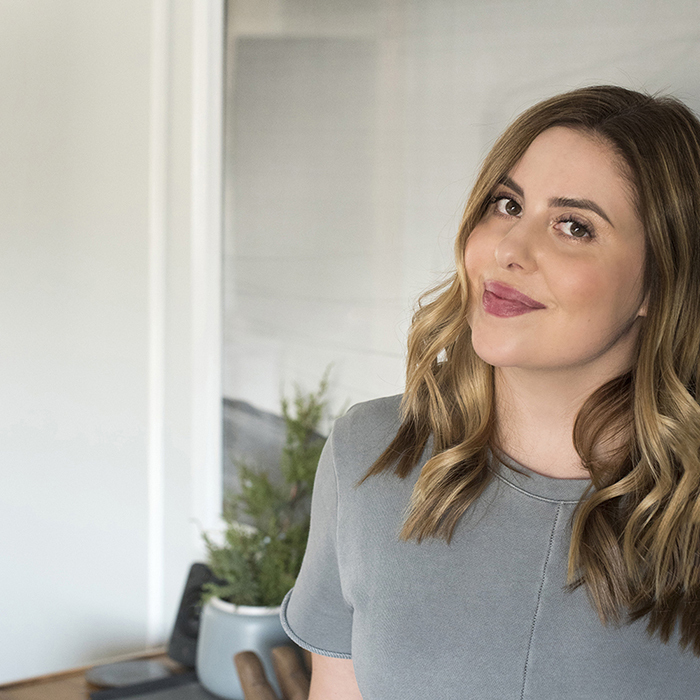 My go-to spot is Trader Joes – it’s a great place for florals and greenery year round! 5. Host a get together and try a new recipe. Winter is the perfect time for hosting and trying new recipes. You could invite a group of friends over for a dinner party and games or host a girl’s night viewing party of one of your favorite shows. Just opposite of a summer cookout, cozy up inside with good company, delicious food, music and yes…more warm fires. Every Monday night I have some girlfriends over to watch The Bachelor and we enjoy wine and snacks. I also hosted a “favorite things” party this Christmas. If you’re not sure what that is…Google it. It’s a ton of fun! One of my favorite Winter recipes is my mother-in-laws Chicken Pot Pie. It is the ultimate comfort food and absolutely delicious! Sarah’s got her own recipe I’ve been dying to try. Pasta is another fast winter cure. This butternut squash ravioli has also been on my “must try” list for awhile now. Carbs and winter kind of go hand-in-hand. There’s no such thing as starting too early on your spring cleaning checklist. If you’re going to be held up in the house due to weather…why not make your home the cleanest it can be? I find it best to tackle a few things a day so I’m not busy cleaning all weekend when I’d like the be enjoying my time with family. Put on your favorite music, get motivated, and get it done. There is something super refreshing and gratifying about living in a clean and tidy house. You just feel better. I shared my kitchen and pantry organization tips last week- check those out here. 7. Get creative and make something. 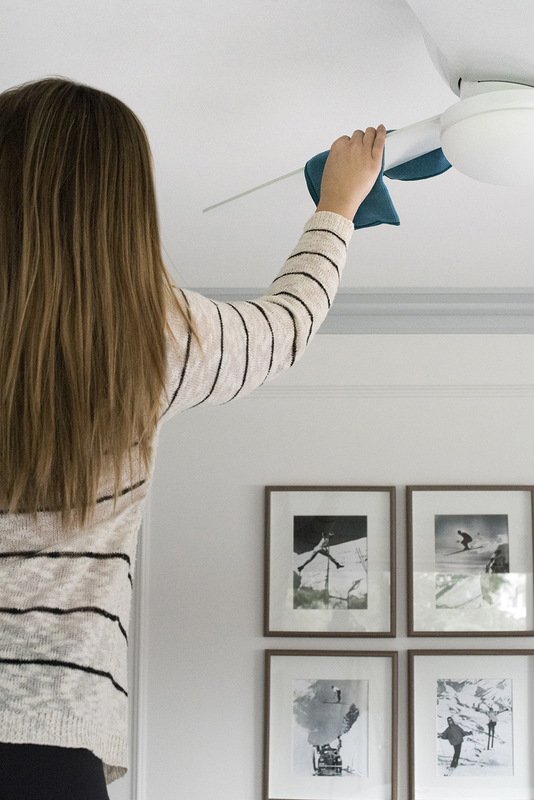 A DIY project will get your creative juices flowing and it’s also a lot of fun! This is a nice way to break your ordinary daily winter routine. Sarah shared this diptych art DIY last year and it is the most popular, easy project on this blog. Making something can boost your confidence, creativity, and self esteem! 8. Plan a weekend away. Sometimes you just need something to look forward to. It doesn’t have to be a crazy expensive vacation… search for cheap flights, take a road trip, or plan a getaway close to home- it could even be in your home city. Might I recommend the Noelle Nashville Hotel, The Proper Hotel in San Francisco, or the Hewing Hotel in Minnesota? They’re all very inspiring! Dry and cold winter weather can take a toll emotionally- but also physically. Allow yourself some down time and treat yourself to an at-home spa hour. A hot bath, bath oils or salts, a face mask, and moisturizer can go a long way in making you feel better. Bonus points for wine and a good book! If you like the bath caddy tray, find that DIY here. Winter certainly isn’t my favorite season, but I find comfort knowing it won’t last forever. You might as well embrace this season of life and have fun! Try something winter-related you normally couldn’t do during another season. Skiing, snowboarding, ice skating, snow shoeing, or tour an ice castle (like Sarah did). These experiences, at the very least, will create lifelong memories! I’m curious to know…does anyone else get the winter blues? If you experience long cold winters like I do, how do you get through them (without booking a full blown Caribbean cruise, of course)? Ha! Believe me…I’ve already entertained the idea of flying south to find sunshine and warmer weather. Which of these tips do you find yourself most likely to try this winter? Hang in there friends…spring is on its way! I love winter, but to be honest – mine is a San Diego winter (i.e., low 60s….brrrr!). We’re in the middle of a three-system rain storm, that counts, right? I went to college and stayed for all of my 20s in Boston, so I know winters, and I loved them when I was out there – snow, rain, SEASONS, all of it. And let’s not forget, that first day of spring after a long, cold winter – it’s like a Disney movie on its most magical day! Anyways, on the menu topic, I just picked up some butternut squash at the store yesterday – during the winter I add it to my lasagna. I roast it in the oven, and then puree it with the ricotta mixture. Adds a really nice, sweet flavor and texture.